I inherited my mom’s DIY DNA. When you grow up as the 11th of 13 kids, as my mother did, you need to get industrious when you want or need something that just isn’t in the budget. As a result….I love to build things. And when you can make something out of an item that doesn’t have any relation to the end product, even cooler. Case in point: I wanted a tall bar and serving table for my patio that would also make it more impossible for my dog Hubert to steal food. We found a wood door and some tile at the Habitat for Humanity ReStore in our area for next to nothing, and already had some of the wood, paint and tile from previous projects. The most expensive part? The two front legs. This piece has already made it through one winter like a champ and it is solid. 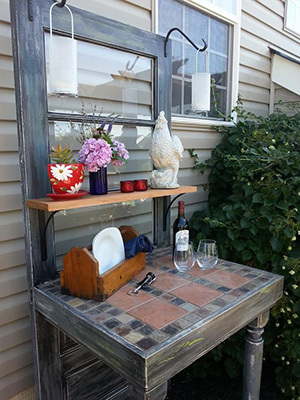 I have already utilized its potential as a bar quite a few times (a large cooler fits right underneath) and my husband uses it as a place to put food that is going on the grill. I am getting the itch to make something for our backyard soon, so I began hunting for ideas and thought I would pass along some of what I found. Anything that has a link to tutorials is in red. 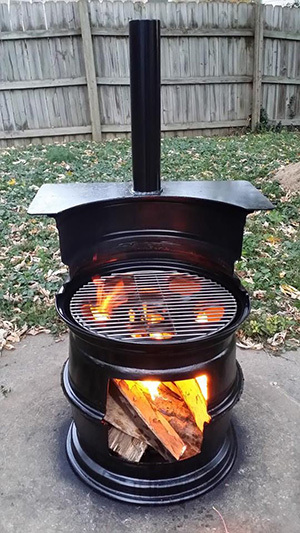 I was really mesmerized when I came across a grill that was made by re-using 2-1/2 truck tire rims, a piece of sheet metal and 16″ of pipe from from an old drive shaft. All you need is a circular replacement grate and you’re cooking. (NOTE: ManGrate is in the R&D stage for a half-moon ManGrate design. We hope to have these available later this year.) I searched for instructions, but the woman who posted the image (above) on Tumblr had no link to the original resource. Obviously you need some mad metal cutting and welding skills, but this shouldn’t cost a lot and you’d get such a unique piece! I’m hoping to inspire someone talented enough to figure it out. And if you do…send pictures! However, I found a video tutorial that shows a guy using a Sawzall to cut 2 tire rims to make a more simple grill HERE. Keg party in the plans this summer? Consider ditching your deposit and think of it as an investment in your passion for beer and grilling. While I would be more comfortable if the base was welded (rather than bolted), this could be a decent-sized charcoal grill. 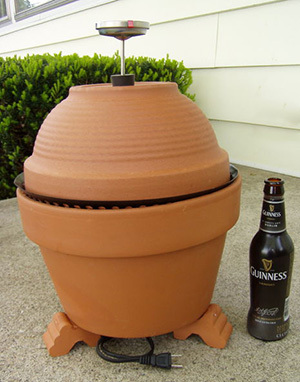 You could also cut a hole on the top, weld a soup can with both ends cut off to use as a chimney and the “beer-b-que” becomes a smoker. This is brilliant! 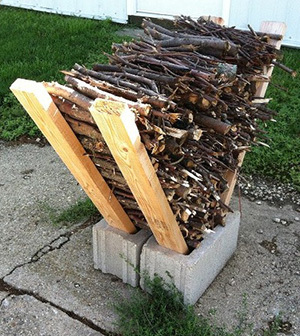 An inexpensive and easy way to store firewood and kindling: two cinder blocks placed side by side (I would join them with concrete glue so they hold together as one unit) and four 2 x 4’s angled into the holes of the concrete blocks to form a “V.” If you don’t have a saw, no sweat: Get the home improvement store to cut the 2 x 4’s to size. This could be a great solution for someone who doesn’t have a large patio or deck….or the budget for an Egg. 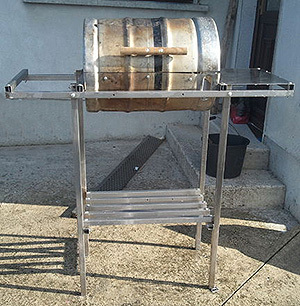 This could also be an option for someone who wants to smoke fish or game at a cabin or beach house and doesn’t want to transport a larger smoker. Alton Brown had done a Good Eats episode where he made one, but apparently it isn’t available online anywhere (there are plenty of YouTube videos of other people’s interpretations, however). Here are two versions of tutorials: Instructables Little Brown Egg (NOTE: I wouldn’t use a teflon-coated pan, which they show in the tutorial) and Smoked Meat’s a Treat. 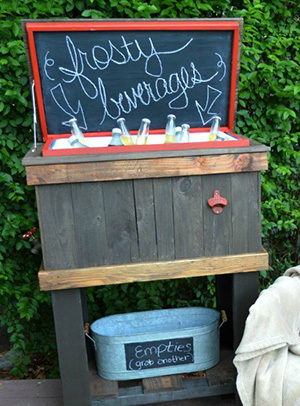 While searching through Pinterest recently I found a few pins where people had made wood-enclosed coolers from old refrigerators, but I couldn’t see how they added any sort of drain to get rid of the water after the ice melted. An alternative: enclose a regular cooler in wood, on legs and attach a bottle opener. This would be fantastic for big parties….you could put industrial (locking) wheels on it and have a mobile bar if you incorporate a shelf area to one side. Check craigslist for discarded barn wood or free pallets. This looks so simple, and could add so much seating in a pinch. You can find cushions online in a variety of sizes. 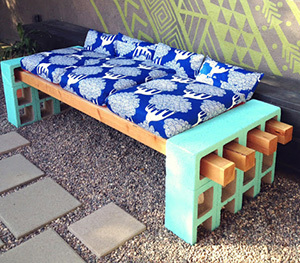 Place multiple chair cushions side-by-side and measure to determine the bench’s length, then get the wood, cinder blocks, concrete adhesive and paint. Again, f you don’t have a saw, get the home improvement store to cut the 2 x 4’s to the length you need. How great would a few of these be surrounding a firepit? 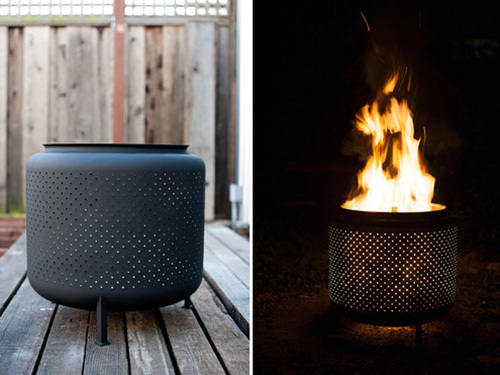 There are a ton of DIY firepit ideas online. Some interesting ones I found included a tractor tire rim as the main pit as well as one using casted concrete to make a fire bowl. But I was intrigued by this. It incorporates a discarded washing machine drum and high-heat paint. If you have welding skills you can create legs like photo shows. But I think it would be interesting to dig a circular area out of the yard about 6” deep and 2″ wider than the circumference of the drum, tamp it flat and pour some sand and then river pebbles into the hole and place the drum onto the pebbles. Finish by stacking one or two layers of concrete edgers around the outer rim of the washing machine drum—the idea is not to submerge the drum too far into the ground, but give it some visual weight as a fire pit. I like being able to see the fire through the little holes of the drum. If you end up making something for your own yard or barbecue, please send photos!